The official Olympic mascot’s popularity is evident. Tens of thousands of visitors flock to the Olympic Super Store gift shops every day near the sports venues looking for the mascot. An actor sparked a social media sensation after wearing the tiger costume and being stuck in doorways due to its almost comically big head. The mascot was created by local design company Mass C&G located in western Seoul that was selected in 2014 by the PyeongChang Organizing Committee to design it, along with “Bandabi,” a moon bear that represents the PyeongChang Paralympics. Here are some of the questions The Korea Herald asked Lee Hee-gon, Chief Marketing Officer of Mass C&G. 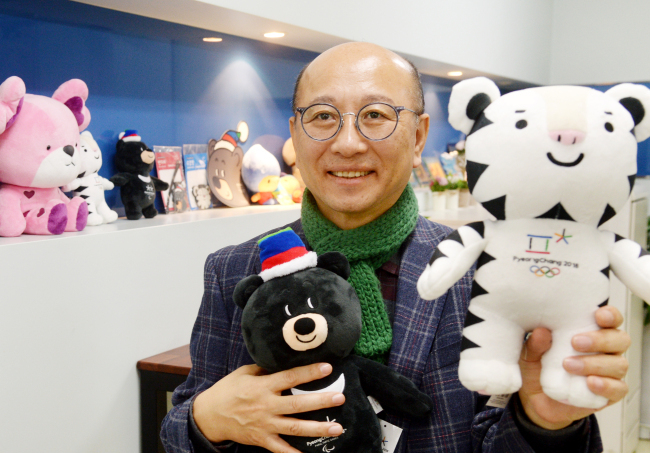 KH: How did you apply for the national project to become the Olympic mascot design group? Lee: It was a public bidding project in 2014, which means everyone could apply for the project to design an Olympic mascot. But the most important question (for the organizers) was whether or not they had the right set of skills and experiences. Our company had them, I believe, as one of very few design groups in the country whose main focus and specialty is in creating animated characters. For nearly 30 years, we designed hundreds of animated characters, including “Kumdori,” the official mascot of the 1993 Daejeon Expo. To become selected, around 100 staff, designers and content creators focused on how to adopt storytelling strategies and marketing methods for an Olympic mascot even before starting with designing. 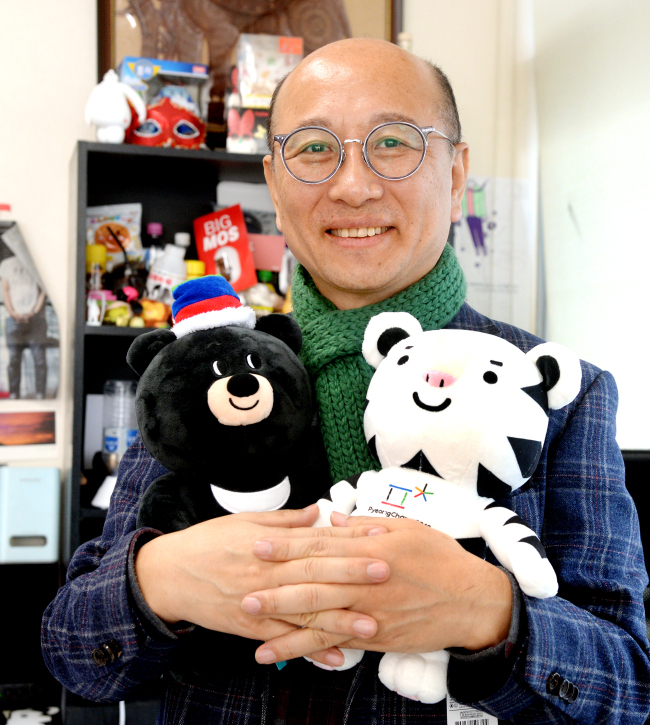 KH: Why the tiger and the bear for the mascots among other animals? Lee: The two appear in the myth of Dangun who is known as the legendary founder of Korea. A tiger represents an adventurous and very courageous character in the myth, whereas a bear is seen to have patience and perseverance. Those characteristics are the main spirit for the Olympic athletes. Most importantly, the tiger is the most favorite animal by people to represent the event, as shown by a series of initial surveys, and was also used for the country‘s first Olympics in 1988. This time, it is a white tiger to represent and act as a symbol of the country, just like pandas do for China. KH: Their genders and ages? Lee: Soohorang and Bandabi have no particular genders or ages. KH: How did you come up with their names, Soohorang and Bandabi? Lee: First of all, it was almost impossible to find names that are interesting, short and easy to pronounce by foreigners and, at the same time, have no copy right. Among 2,000 different names we finally came up with, the two survived after going through a number of consulting to see if they evoke no bad images when written in foreign languages. KH: Why such a big head size for Soohorang? Lee: What is special about it in comparison with other Olympic mascots is that it has so many facial expressions, just like human beings do. In order to put them onto its face, we decided to enlarge the head. And we knew by fact that people tend to prefer big heads in characters. Big heads make them more adorable. KH: How did it feel when you first unveiled the characters to the world in 2016. Lee: We were very nervous before we unveiled them because we were not sure how they would react. But it turned out the public reaction remained very positive about the new Olympic characters. One contributing factor is that the organizing committee distributed emojis of Soohorang and Bandabi in partnership with KakaoTalk (most popular mobile instant messaging application in South Korea). People got used to the characters a lot faster than we expected thanks to the emojis, although we think it would be better if they give them out for free for public interest.